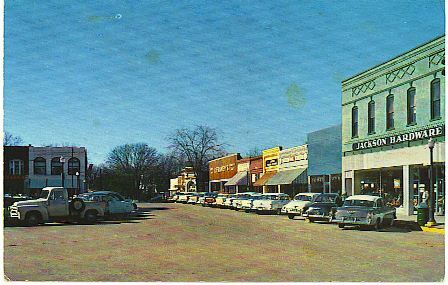 TUESDAY, June 28th – Small towns have always been a part of my life and I grew up in four of them: two of them real and two of them fictional, each one different in some ways, alike in others but all treasured and valued more with each passing year. I don’t remember at what point along the way I decided that small towns were the best place to live but with the exception of a very few, fleeting moments, I can’t ever remember wanting to live anywhere else but where I was and to date, I’ve stuck with that plan. So what are the things I like about small town living? I like that I am able to leave my house and be at work in three minutes and I always rub it in that it takes my wife twice as long to get to her job four blocks further east. I grew up in a neighborhood where two of our neighboring families commuted to Atlanta every day and they were still doing this long after I entered the workforce. I realize that not many people can both live and work in a small town and I don’t take that for granted. Not one bit. I also like having roots here and that in addition to knowing the history of my own family, I’ve also come to know the history of many other families that go way back here. I like knowing that six preceding generations of my family lived here, that five of them are resting within six miles of my house and that I can take my son there and show him how deep his roots go in this county. I especially like that I can go to church, go by the grocery store, visit the doctor, pick up prescriptions, go to the bank and fill up the car all within the same square mile. Big city dwellers often cite the convenience of having everything within walking distance that they might want but I would counter that if you have God, groceries, medicine, money and gasoline and can get to any of them within five minutes, you pretty much have everything you might need and with a small town, you get added perks. It’s these that I write about here, the fringe benefits that bridge the gap between having what you need and having what makes you happy and with that said, let’s debunk some old myths about small towns. There is nowhere to eat in a small town. If that were true I wouldn’t have been on a diet for the past eight months and I like that I can have genuine, authentic barbecue that is indigenous to the South whenever I crave it OR I can choose between Mexican, Italian and Chinese cuisine and be at any of them in minutes. Steak or fried chicken? Two blocks south of downtown. Soul food? Three blocks west. Can’t decide? Grocery store. They may not be Olive Garden or Longhorns but they are operated by local people that you run into at that same grocery store. Everyone knows my business in a small town. Let’s face it, if you have a Facebook, Twitter or MySpace account, everyone already knows your business and not just in the small town you live in. My grandmother used to say that if you didn’t want everyone to know your business, don’t air your dirty laundry. Most of the information that is out there is what we choose to put out there so if you don’t want everyone in the middle of your personal life, don’t hang it on the laundry line. On the other hand, I like it that my local insurance agent could follow our recent accident in Tennessee on Facebook and have all the answers ready when I called. This also reminds me that I need to go by there and get this claim settled before she reads this. There is nothing to do in a small town. I disagree with that statement. Between an active recreation department, a bowling alley, a skating rink, two state parks, a nature preserve, the Chamber of Commerce, the library and umpteen hundred churches there is always something to do. True, these things may not always run on a schedule that suits everyone but if it’s truly important you’ll adjust accordingly; if not, just open the local newspaper and find something else going on. Everyone that lives in my neighborhood is always doing something, from the youngest couple there to the oldest retired person and we all wave at each other as we are coming and going in and out of our driveways. If there was nothing to do I wouldn’t need a BlackBerry to keep it all straight. There is nowhere to shop in a small town. Again, I have to disagree with that but with the understanding that I do agree your shopping choices are more limited in small towns. Moreover, sometimes goods purchased locally cost a little more than they do at the volume retailers like Wal-Mart or Target but there are tremendous advantages to shopping locally and my family tries to balance that. At Wal-Mart, you are greeted at the door by a pleasant and helpful retired citizen who doesn’t know you and won’t remember you the next time you come in unless you are by there every day. At local stores, you are often greeted by name, asked how your family is and if they don’t have what you want, they’ll move heaven and earth to get it for you. The corner druggist (we have two of these plus one in the middle) knows the medicines you take and they know whether you should take it with the activity you are currently engaged in. The local banker usually knows if you’ve had hospital bills for a new baby and generously offers to defer a loan payment to help out. The local Chinese restaurateur knows you can’t take MSG in your meal and makes sure your food is free of it even when you forget to mention it. Best of all, for many of them, owning a business isn’t just about making money; it’s about interacting with their friends and neighbors, sometimes coming down a bit on the price to make the customer feel good about their purchase and even free home delivery and setup on the big stuff. My wife and I pamper our washer and dryer now because we fear the coming day when we have to buy a new one without having the Brown Sisters to make us a deal we can’t refuse, tax included, with delivery to our house and removal of our old appliance. Customer service is a hallmark of living in a small town. All of the above are reasons for loving the small town life but it isn’t just about conveniences or driving distances-living in a small town is like living in a big family and you just don’t get that living in a big city. You don’t feel that sense of belonging to something that is bigger than you, of being woven into the fabric of the community that living in a small town provides you and even though it helps to grow up in the town you live in, it isn’t a prerequisite. Some are locals by birth; others are locals by acceptance because they found the place where they were needed in the fabric and they were woven in by the other members of the community. I can think of two local bankers, neither of whom grew up in my hometown, who are locals because we say they are. I mentioned growing up in four of these towns. Jackson is certainly first on the list because it is my hometown, the place where I was “born and raised” (ok, maybe not born because I was really born in the hospital in Atlanta) but I came home to the county my mother was raised in and her parents and so on and so on. I grew up on its quiet, shaded streets, attended church at the same place all my life, attended the area schools, joined the volunteer fire department and went to work for the local government. I knew who owned every store on the square in town, got my first haircut in a real barber chair from a real barber, went to the county fair every fall, rode with 14 other kids in the Police Chief’s car every year the parade was held, learned how barbecue was cooked from my father and my grandfather, drove up and down Third Street with every other teenager of driving age each Friday night and got my first bicycle from Western Auto. I have watched twelve pastors come and go from our church, lots of families unite in marriage and I’ve watched the same two men put many people I’ve known and cared about into the ground with dignity and compassion….and witnessed firsthand how the loss of a single person can bring that big old small-town family together, complete with a lot of Tupperware dishes of food and mountains of fried chicken. All of this and more is what Jackson is to me. 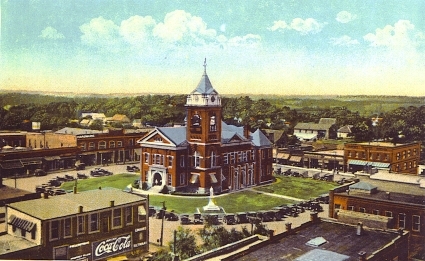 Jenkinsburg is another town that I grew up in because if I wasn’t in Jackson, I was usually in Jenkinsburg, visiting with my great-grandmother and my grandmother, going with her on rounds to visit some of the most interesting characters I’ve ever known. If I wasn’t doing something with her, I was tagging around after my grandfather as he worked in the yard, eating home grown fruit from his trees or riding with him “to town” (Jackson) to get something for the lawn mower. Jenkinsburg was truly a small town of about 300-400 people with a post office, a general store and a front row seat to every train that ever came through the county. There was plenty for a small boy to see and get into. Just hearing the train horn in the distance was enough to send me running for the front yard to watch it come by. The best part of Jenkinsburg was Sunday lunches with my entire local family, a weekly occurrence from birth until well into my thirties and I took it for granted then and miss it badly today. Jenkinsburg is also a special place in my life. I also spent every Thursday evening for many years in a fictional place called Walton’s Mountain and other times in a fictional town called Mayberry, both of them small towns full of interesting, compassionate and loving people who were strangely similar to many people I knew in Jenkinsburg and Jackson. Family night television with the Walton’s was an hour my brother and I looked forward to spending with our parents and we gathered in front of the television where I held my first job as a remote control for the TV. Earl Hamner might talk about how, if he listened, he could still hear his father’s voice echoing in the foothills of his mountain home but I can still hear my father’s voice echoing in the den saying “Put it on channel 5”. I feel like I grew up with many of the Walton children watching that show for its entire 9 season run. Then there was Sheriff Andy Taylor and the town folk of Mayberry, wonderful people who brought life and color to a show that was mostly filmed in black and white and the town itself reminds me today of how a lot of things were like in Jackson when I was a young kid. They didn’t know me or the countless others that watched them but we knew them and we became part of their small towns. Many of us still spend time in both places whenever the TV schedule permits and I am glad reruns allow for this because my son enjoys watching these shows as much as I did. I hope it is helping him to become aware of how lucky he is to grow up in a small town surrounded by caring people and family. It’s certainly a different place to live today because time and progress has changed some things, maybe not as quickly as Atlanta or New York but it does change….and the cast of characters changes through the years and forms new dynamics and relationships….but the essence of the small town stays the same. We succeed together and we fail together; we rejoice together and we grieve together. We fight and bicker, hug and make up; celebrate what we do right and hopefully learn from what we do wrong. We may be a town small in size but we are a really a big family with a big heart that loves all its members and always has room for one more. When it’s all said and done, that’s really all that matters in the end. What a nice remembrance. Although I grew up in a medium-sized city (South Bend, Indiana), I have some similar memories of a slower pace and a tighter-knit feel. I miss it. We have a couple of mid sized cities around us that would have been my second choice if I had to live somewhere besides here. While bigger, they still have much of the small town feel and charm that I would miss if it were gone, including many of the great people too. Thanks for reading and for your comments! Once again Michael, a beautiful tribute. Thank you Susie! We both know its not a perfect place but it was a great place to grow up!